On paper it looks so simple – combine water, cereal, and hops together in a big pan and boil it for an hour or so. Cool the liquid and wait for wild yeast in the air to land or add cultured yeast so it ferments the sugars in the brew. Result – beer. In practice it is more complicated. It is easy to make bad beer and much trickier to make good beer so the brewers who do make the good stuff are virtuosos. Brewing is alchemy. Each beer starts with a recipe when the brewer decides which malts to choose, what hop varieties to add, and alcohol strength. Brewing is like cooking but with bigger vessels and more washing up! 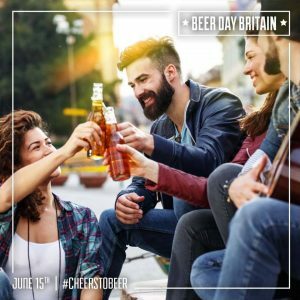 Beer, the world’s favourite alcoholic beverage, is the magical result of brewing water, malted cereal (usually barley) and hops together then fermenting the brew with yeast. In most countries, Britain included, there are no rules on adding additional ingredients to beer. Some brewers include adjuncts such as fruit, spices, herbs, botanicals, coffee and chocolate. Britain has the perfect climate and soils for growing barley and hops. It rains quite often so water is readily available, and trillions of yeast cells float around in the air waiting to be cultured for use in brewing. Thank you to Mother Nature for providing everything brewers need to create Britain’s national alcoholic drink!